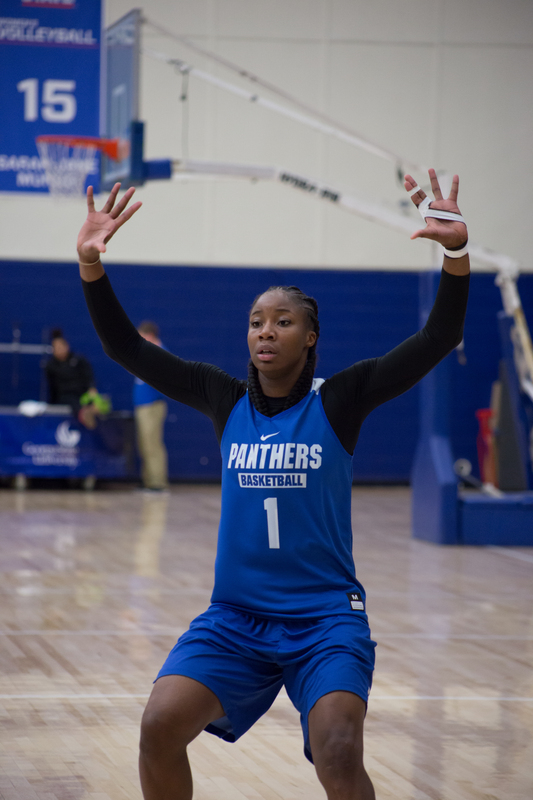 Senior forward Tiffany Holston transferred to Georgia State this fall because of its academics, and because she had some eligibility left she would play basketball. The Panthers are sure lucky that she decided to play. She has without a doubt been the team’s best and most consistent player. She came to just help as she put it, but she is doing way more than that. She leads the team in scoring and rebounding. Holston, however, is more focused on her academics and she went on to explain that here. When you decided to transfer to Georgia State what were some of your expectations for school and for basketball? Holston: My expectations for school was definitely to get my masters degree, I knew it was something different it was undergrad so I knew I had to come in with a full head. As far as basketball, my main expectation was just to come and help, as an athlete I’ve basically done everything I could do, but now I just want to help others. How is school going for you so far, just the academics side of things? Holston: Well I’ve always been an academics person, it’s not as easy as I want it to be, but it’s definitely something I can handle. What are some of the challenges? Holston: Right now with school I would say the challenges are trying to travel and stay on top of things and basically communicating with professors. Can you talk about being a student-athlete because a lot of people don’t really realize how tough it actually is? Holston: It’s definitely hard, but it’s doable you just have to have great time management and you have to be focused and basically do what you have to do because if you can’t do it in the classroom you definitely can’t do it on the court. You collected your 1,00th rebound this season, how did that feel? Holston: It felt good actually, as a player I always think about rebounding and that’s my key thing before scoring is rebounding. So when I realized that I reached my 1,000th rebound I was excited, but I got to keep going, so 1,000 rebounds I gotta reach 2,000 or how many ever I can get. You seem like the type of person that takes their craft seriously, what things do you work on on a daily basis to be so good? Holston: My first thing I work on is staying strong because without being strong with your core and your legs you can’t get rebounds, you can’t push people out of the paint you can’t do anything. So my main thing is to stay strong, get in the weight room and work with [Assistant Strength Coach] Nate [Majnaric]. My second is basically just working around my area in the paint, if I don’t work around there, it won’t work. My third thing is to play smart because if you have a great IQ in basketball everything else will come to you. You guys have five seniors but besides that, you do have a relatively young team. Do you ever feel like the mom around here sometimes? Holston: I definitely feel like the mom, sometimes the grandma. I’m much older than the rest of the team, but I can say they do look up to me as much as I would say a mom. I feel like a mom too sometimes on the court because I’m old, my knees get a little weak but for the most part, I enjoy teaching and showing wisdom to the girls. Do you have a favorite movie? Holston: Favorite movie? I would have to say brown sugar. Holston: Favorite song? I’m more into classical jazz so I don’t really have a favorite song. Holston: It’s hard, I can’t say because I’ll get in trouble. My family members are really big jazz fans. If I say one name then my dad will say “hey I thought you liked this person,” so I can’t really say. Holston: Favorite book? No, I don’t have a favorite book. Do you have a favorite celebrity or athlete? Holston: I would say Gabrielle Union, she’s my idol. My favorite athlete would definitely be Lebron James, I steal all my craft from him. I try to do exactly what he does. Not all the time, not the flopping and the crying but I love Lebron. Do you have a favorite tv show? Holston: ESPN, I watch it all day everyday .